In my other life, as a poetry editor for a youth-oriented quarterly journal, I consistently find myself frustrated by the lack of works in the Australian poetry scene that dabble in the historical. 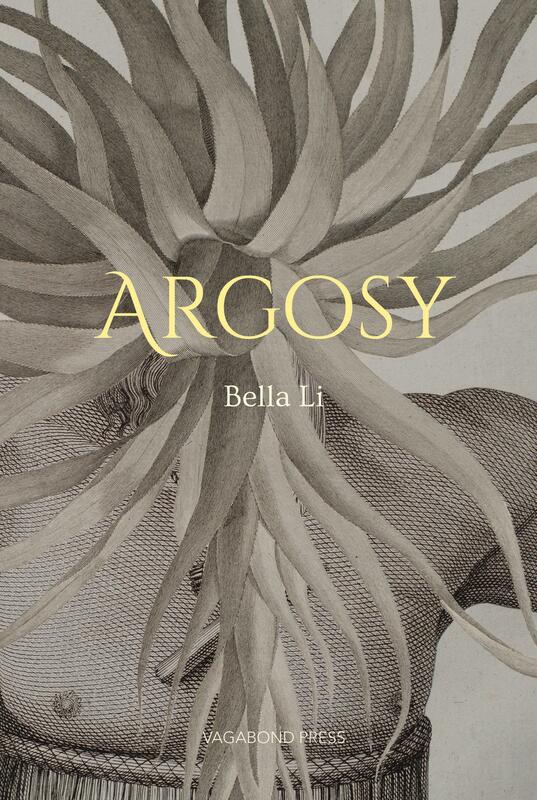 Bella Li’s debut poetry collection, Argosy, fills this gap with subtlety and style. The collection begins with a series of collages that combine black-and-white colonial sketches of southern hemisphere explorations with often brightly coloured depictions of wildlife. Butterflies and conch shells obscure the faces of the island’s inhabitants. Animals are spliced with other animals. In my favourite collage, a mountain-sized woman emerges from the centre of a body of water, watched by a group of puny, gun-toting colonists. This image is equal parts horrifying and curious. As monstrous as she is, this woman forms part of the landscape and dwarfs the men who seek to harm her. From here, Li delves into a suite of complementary prose poems that describe an ill-fated ocean voyage to a strange and frightening place. As I read, I kept turning the pages back to look more closely at the preceding collages, and this amplified the speaker’s voice. There’s a wonderful disharmony to these poems: they radiate wonder and doom at the same time. Following this first section are more prose poems – this time more contemporary, and with more explicit narratives, this time accompanied by a combination of collages and photographs. These later sections feature women – their ideas, work, bodies, and their place in the world. Prose poems can often be delegated to an in-between space somewhere beyond conventional poetry. However, as I was reading these poems, I felt like Li’s choice of form furthered the intertwining of narrative and illustration already present in her work. Argosy is the sort of book that will bounce between your bedside, bookshelf and coffee table, and is a fantastic example of contemporary Australian poetry that deals in the historical.